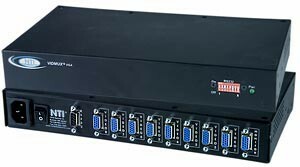 4 port VGA switch. Crisp clear 1920x1200 resolution. Compatible with PCs, SUNs and MACs with VGA video. Compatible with PCs, SUNs and MACs with VGA video. Local control is not available when "-RS" is specified.